Day One of the Las Vegas Burger Tour had been a series of minor let-downs. None of the burgers that I tried had lived up to the hype or my personal expectations. I had read a few good things about KGB by Chef Kerry Simon. It was located inside of Harrah’s casino, and on the walk through that faded Vegas flower, I grew more and more skeptical about what sort of burger I was about to sample. This was to be my 4th stop on the 3-day Las Vegas Burger Tour. I met briefly with Zach, the manager, and I was pleasantly surprised to see that he was really professional and frankly just into food. Next I had the pleasure of sitting with Chef de Cuisine, Eli Fortney. Chef Fortney was C.I.A. trained and had already earned his chops in various fine dining establishments. Eli managed to be both soft-spoken and enthusiastic about his craft and the product that he was turning out at KGB. I discovered that he really liked Thai cooking, and that he had introduced some of those influences, subtly, to the menu. After speaking with the chef, we settled on the American Standard with American cheese cooked to somewhere between Med-Rare and Medium. 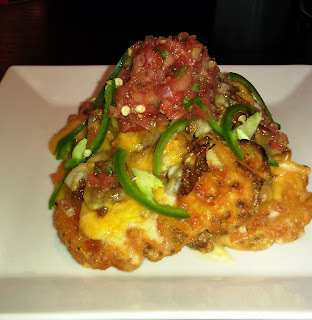 Prior to the burger arriving, I discovered that KGB had been featured on the Food Network the previous day, specifically the Waffle Fry Nachos. This was a deceptively simple tasting yet very complicated dish. Chef Fortney created the dish with very crisp, seasoned waffle fries, a finely minced Pico de Gallo (bordering on salsa), a blend of Cheddar, and braised Short Ribs, which were seasoned sloppy joe-style. The dish was garnished with thinly sliced, fresh, green pepper. It was superb. The chef did not repeat any seasonings in the components of the dish, and while each component was quite good (the Short Ribs were fantastic), the sum of the parts was gorgeous. It was a wonderful composition of textures, flavors, and temperatures. I hope that some day they serve this with an over easy egg on top as a hangover cure. I also sampled a very clever shake. It was a Pineapple Upside Down Cake Shake with jalapeno. This was sweet, creamy, citrusy, and the jalapeno added a subtle heat, which amplified the flavor palate for this novel, dessert item. The American Standard burger arrived in about 15 minutes. The Beef: KGB took daily delivery of a custom, All Natural, 100% Angus, Myers Ranch beef blend from their purveyor. The blend was 50% Chuck, 25% Ribeye, and 25% Brisket. The fat content was 20%. Surprisingly, the burger patties came pre-formed from the supplier. This concerned me, but my concerns evaporated with the first bite. This was freaking great! The beef was perfectly juicy, beefy, with firm steak notes, and just the right taste of minerals from the blood. It tasted intensely of fresh beef with no trace of aging. I thought I would miss the aged funk, but the cheese filled in seamlessly. The beef was utterly delicious, so this was an 8 ounce burger, which was challenging to set down. It was absolutely dripping with beefy goodness. The Seasoning: The interior was unseasoned, and that was OK. The beef stood perfectly well by itself. The exterior was competently seasoned with just salt and pepper, just the way it should have been. The Sear: This was my sole qualm with this cheeseburger. The sear was practically non-existent. This worked for and against the burger. The texture was missed along with the opportunity to concentrate the beef juice flavors on the exterior of the patty as it cooked. However, this was a burger, which was 50% Chuck, the lower cooking temperature heated the burger more evenly throughout, and this melted ALL of the collagen in the Chuck. This created an intense beefy flavor throughout the bite. The Preparation: The purveyor that formed the burger patties for KGB really had it down. 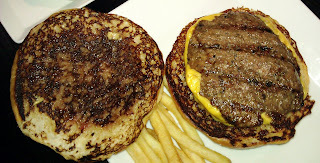 The beef was ground medium-coarse, and loosely formed into thickish, flat patties. Somehow these burgers avoided being rubbery. Had I not asked, I would have assumed that they were forming patties to order in the small kitchen. As previously mentioned, the burgers were cooked slowly and with great care on a gas-fired grill. The burger was cooked just below Medium, which was exactly where that burger needed to be. Note that the burger was turned only once during the cooking process. Q: You know what’s good? A: A melted slice of American cheese is good. Q: You know what’s twice as good? A: Two melted slices of American cheese, that’s what! At KGB, the American Standard was topped with two gooey, melted slices of American cheese. American cheese just works…every time…it is not a tricky as Cheddar, and it contributes creaminess, savory, and umami without dominating the flavor profile of a dish. In this case, the American cheese took on the role of packing the dish with umami and fusing the perfectly toasted top bun to the burger patty. The Bun: The flat, unseeded burger bun came from the bakery at the Imperial Palace next door. At first glance, it appeared to be a thin, floppy mess. My initial assessment could not have been more wrong. The mildly sweet bun was yeasty, toothsome, moist, and fresh. What delighted me was that the bun had a greater diameter than the burger, and the bun was wonderfully toasted. What this created was a little bit of crunch with every bite. This was a real treat, and when I asked the chef about it, he indicated that this was intentional. The thin bun was far more resilient than I would have guessed, and it absorbed and contained the juicy and substantial beef without deteriorating in the hand. The bun was perfect. The Meat To Bun Ratio: This was perfect. Every bite was just right. 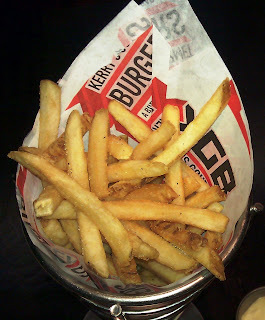 The Fries: The fries were brined, par-cooked, coated in potato flour, and delivered to KGB in a frozen state. The fries were also excellent. The peel-on fries were nicely crisped and browned in a soy oil blend. The seasoning was spot on, and the fries remained crisp even as they cooled. The Sides: The Iceberg lettuce was fresh, sweet, and crisp. The tomato slice was beefy, ripe, juicy, and very flavorful. I ate my veggies. The Value: $10 for a nearly perfect burger and fries. The value was very good at KGB. Chef Fortney and team prepared a nearly flawless and absolutely delicious cheeseburger. I was so happy to finally have a good burger, after a disheartening first day in Las Vegas, that I went back to the line and fist bumped the brigade out of appreciation. I strongly urge visitors to Las Vegas to visit KGB while Eli Fortney is running the kitchen. 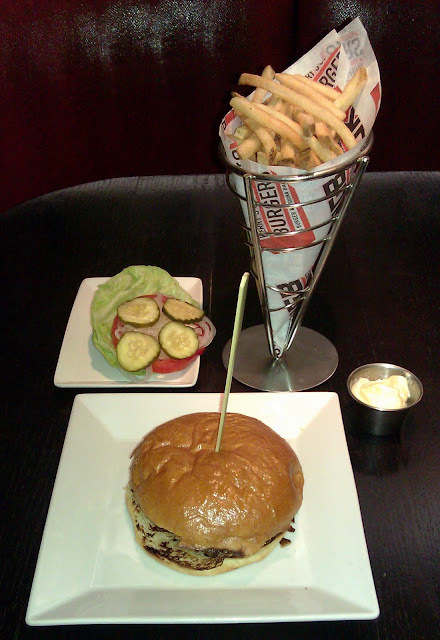 Burger Review : Go to KGB …go there soon. It was just that good.